The North Eastern State Trail (NEST) is a beautiful rural trail like no other as it traverses farmlands and former lumber towns across the region. It is surfaced with crushed limestone and its flat terrain makes for easy cycling through rural landscapes and forgotten places. Highlights include the Metz and Millersburg historic sites, beautiful river crossings, views of Tower and Kleber ponds as well as Mullett Lake. The trail towns of Alpena, Posen, Millersburg, Onaway and Cheboygan provide amenities for trail users and scenic stops in Metz, Hawks, Tower and Aloha offer excellent rest areas. If you want to experience the quiet of rural Michigan, with more wildlife than people, this is the trail for you. 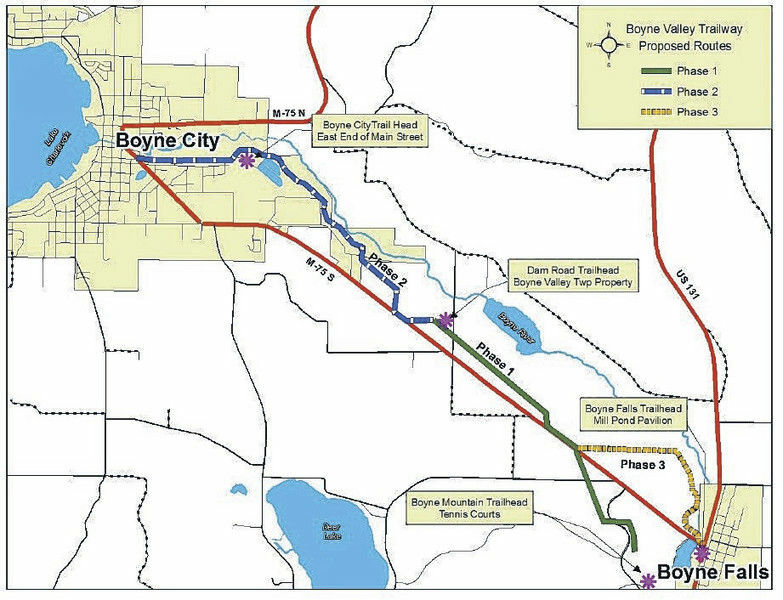 The improvements to the former railroad corridor were completed in 2011. They involved a true collaboration between two state departments, local governments and a nonprofit organization. The Michigan Department of Natural Resources (DNR) which owns and manages the trail, has been working with the Michigan Department of Transportation (MDOT) which completed the engineering for the project and is responsible for project oversight. The Top of Michigan Trails Council (TOMTC) helped create the funding package for the trail project including 60% through a Federal Transportation Grant, 20% from MDOT, 15% from the DNR via the Michigan Natural Resources Trust Fund Grant and 5% from local units of government. The trail surface is maintained by the Michigan Department of Natural Resources Parks and Recreation Division. Allowed Uses: All non-motorized users (including horses) year-round, and snowmobiles from December 1 to March 31. Notes: The mile markers use the historic railroad numbering from the Detroit to Mackinac Railway. Mile marker number 125 is northwest of Alpena and number 194 is south of Cheboygan. PLEASE NOTE: At times, this rural trail has limited cell coverage. Be prepared to perform some simple repairs (i.e. flat tire repair), since some areas are very remote and there is limited road access. Alpena Trailhead (P,R,W,A): The Alpena Trailhead is on Woodward Street on the north side of Alpena. At the trailhead you’ll find parking, RV/trailer spaces, restrooms, water and a pavilion. 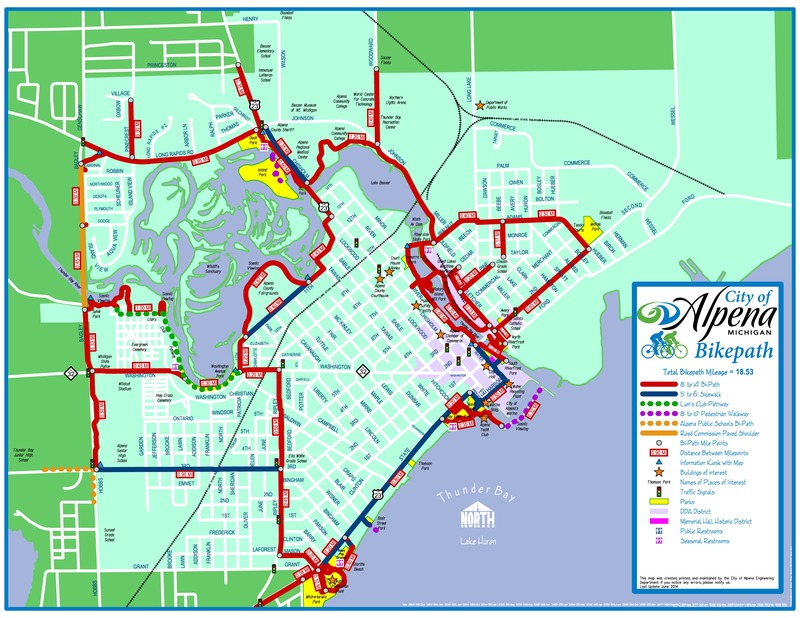 It is the terminus of the North Eastern State Trail although it connects directly with the 18-mile Alpena Bi-Path, part of which will take you into downtown Alpena, about 2-3 miles. Alpena is a full-service community with hotels, restaurants, shops, a brewery, museums and parks. This 17.6 mile trail segment runs through farm and forest lands to the Village of Posen. Along the way you pass former lumber towns of Cathro and Bolton. Look for a sinkhole north of Maple Lane Road. There is a winery near the trail north of Alpena off Truckey Road and a bar/restaurant in Bolton. Posen Trail Access (P,R): Just west of M-65 along Railroad Street, park between the road and trail near the Posen grain elevator. There is a sign and a porta-potty (available June 1 – September 30). Posen has a store. 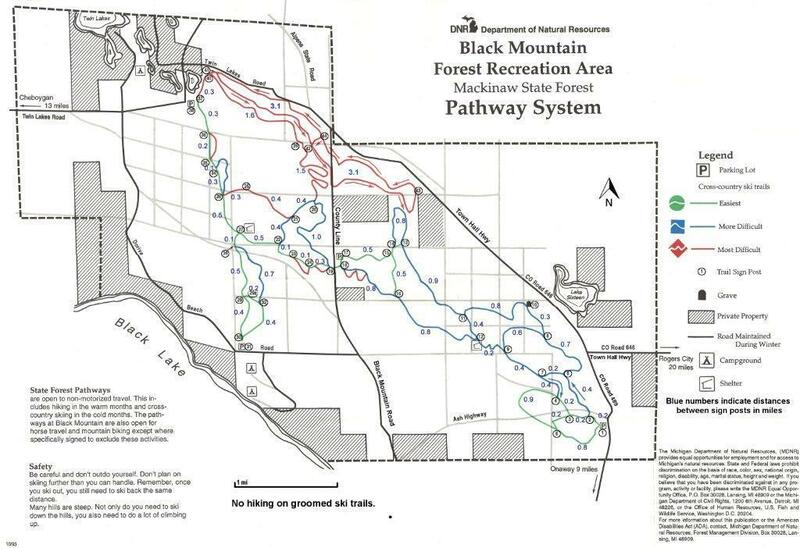 This 5.6 mile trail segment passes through mostly wild land with some cultivated farm areas. Bends in the trail and small grade changes make this section fun to ride. Coming into Metz there is an historic sign near Hagensville Road and then an entire interpretive site in Metz. Metz Trailhead (P,R,W,A): Metz, a very small community, has a full service trailhead located on County Road 441 with parking, a pit toilet, water, playground, picnic pavilion and historic interpretive site about the 1908 Metz Fire. There is a restaurant/bar located across the trail. From Metz to Hawks the 4.3 miles of trail continues to meander slightly in elevation going through more farmlands, wetlands and forest. Hawks Trail Access (P,R, W,A): The community of Hawks has a small trailside park along County Road 451 where there is limited parking. The park has water and a picnic shelter. There is a porta-potty available June 1 – September 30. There is a store and restaurant/bar nearby. This 8.9 mile trail segment passes through scenic country including wetlands, hunting lands and the former Big Cut quarry before getting to the Village of Millersburg and its historic depot and park. Millersburg Trailhead (P,R,W,A): Located just east of County Road 638 in the Village of Millersburg, this modern trailhead facility is a nice destination in itself. It is a great place to stage a ride. The depot is the last remaining depot on this trail and is a local history museum (hours are limited). There are modern bathrooms, water, picnic shelter with a fireplace and interpretive signs. Millersburg has a store and restaurant. Just west of Millersburg the trail crosses the Ocqueoc River. Check out the historic interpretive sign about the former “culvert bridge” that was recently replaced. The trail segment of 9.2 miles into Onaway crosses a number of rivers and wetlands with wonderful views. Just before the City of Onaway the trail crosses M-68. Onaway Trail Access (P): The trail crosses M-211 just north of M-68 in the City of Onaway. Onaway is a full-service community with a hotel, restaurants and shops. Check out the Awakon Park which is a sculpture park located in a former ruins of an industrial site. The short segment continues through wetlands and forest lands before it crosses the Black River at Tower Pond. This is a beautiful location with the small Tower dam to the north of the bridge. Just west of the bridge is the Tower Trailhead. Tower Trailhead (P,R): Tower Trailhead (currently unmarked) has parking and pit toilet. It is located off Barclay Avenue north of M-68. There is a store in Tower, about a mile away on M-68 near the river. This 14-mile segment of trail is remote and beautiful. It runs along and across sections of Kleber Pond (part of the Black River) and its tributaries. After Kleber Road (the dam is just north of the trail crossing) the trail runs through nine miles of remote State forest lands (primarily hardwood forest). There are occasional creek crossings with wetlands and beaver ponds. Eventually the trail crosses Mann Road and then M-33 before it enters into Aloha State Park. This park on Mullett Lake has camping, a picnic area, beach, bathrooms and water and is a great place to spend the night. Aloha Trail Access (P,R,W,A): The Aloha State Park serves as the trail access (recreation passport required). Aloha has a modern campground, wonderful lake access, restrooms, water and a picnic area. There is a store in the small community. This 7.8-mile segment of trail runs along the east side of Mullett Lake or behind the resort communities along the lake. There are outstanding views. The trail crosses the Cheboygan River on an historic trestle bridge. Take time to gaze at the boaters along the inland waterway. The trail then crosses US-27 and heads north through farmland into the City of Cheboygan. The North Eastern State Trail ends where it merges with the North Central State Trail just south of W Lincoln Ave. The Cheboygan Trailhead, located just north of W Lincoln, serves both trails. Cheboygan Trailhead (P,R,W,A): The Cheboygan Trailhead is located between Lincoln Avenue and Taylor Streets just east of S Western Avenue. It has parking as well as trailer/RV spaces, restroom, water and a pavilion. The City of Cheboygan is a full-service community with hotels, restaurants, shops, a brewery and beaches. To get to downtown, continue north on the trail about a half of a mile and turn right on Division Street which will take you to the center of town. From Cheboygan you can continue northeast on the North Central State Trail to Mackinaw City or south on the NCST to Indian River and Gaylord. You can reach the North Central State Trail without going into Cheboygan by taking Riggsville Road west about a mile south of the Cheboygan Trailhead. Riggsville Road is paved but is often quite busy with traffic. 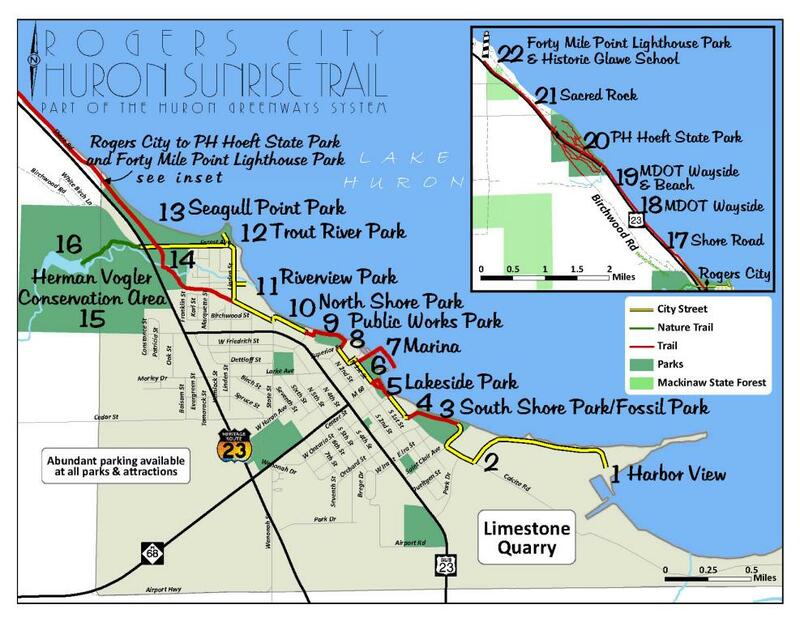 You can reach the North Western State Trail without going into Mackinaw City by following this route: A mile south of Mill Creek State Park take Hebron Mail Road south to Potter Road. Follow Potter as it goes over I-75 and crosses US 31 where it becomes Linsley Road. From there it is a short distance to the trail. Go left to Petoskey or right to Mackinaw City. There are also excellent chances for “loop” rides through fairly remote country on local roads from several points along the way.